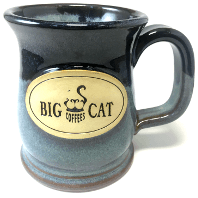 From the comfortable sturdy handle to the artful curves, this best-selling mug is a delight to experience. Skillfully handcrafted in Wisconsin — 16 ounces; 4.75”h. Dishwasher, microwave and oven safe. 100% lead-free. FDA and California Proposition 65 compliant. Ounces may vary. Due to the nature of handmade processes, styles and glazes will vary in consistency resulting in unique appearances. Night Sky is a two-tone glaze based in stormy blue and topped with the blue-flecked darkness of night!